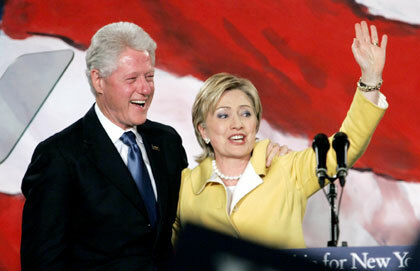 Democratic US Senator Hillary Clinton and her husband, former President Bill Clinton are cheered by supporters after her acceptance speech at the New York State midterm election night celebration in New York November 7, 2006. Washington - Resurgent Democrats swept toward control of the House and grabbed Republican Senate seats in Pennsylvania, Ohio and Rhode Island on Tuesday in elections shaped by an unpopular war in Iraq and scandal at home. Aided by public dissatisfaction with President Bush, Democrats won gubernatorial races in New York, Ohio and Massachusetts for the first time in more than a decade, then put Colorado and Arkansas in their column as well. Dems pin hopes on Senate victory in Va.
Bush monitored the returns from the White House as the voters picked a new Congress certain to complicate his final two years in office. He arranged to call Democratic Rep. Nancy Pelosi of California -- in line to become the first woman House speaker in history -- on Wednesday morning, then hold an afternoon news conference. "They have not gone the way he would have liked," press secretary Tony Snow said of the election returns. But that was cold comfort for the Republicans, who have controlled the White House and both houses of Congress for most of the time since Bush took office. By 11 p.m. EST in the East, Democrats had picked up 19 House seats now in Republican hands, in all regions of the country. They needed 15 to end a long turn in the minority, and a final result would depend on dozens of races yet uncalled. Republican Rep. Nancy Johnson lost in her bid for a 13th term in Connecticut; Anne Northup fell in Kentucky after 10 years in the House; and Rep. Charles Taylor was defeated in North Carolina. Scandal took its undeniable toll. Democrat Zack Space won the race to succeed Bob Ney, who pleaded guilty to corruption this fall in the Jack Abramoff scandal. Republican Rep. John Sweeney lost his seat in New York several days after reports that he had roughed up his wife, an allegation she denied. Surveys of voters suggested Democrats were winning the support of independents with almost 60 percent support, and middle-class voters were leaving Republicans behind. Over half of the voters registered dissatisfaction with the way Republican leaders in Congress dealt with former Florida Rep. Mark Foley and his sexually explicit computer messages to teenage pages. They voted overwhelming Democratic in House races, by a margin of 3-to-1. The surveys were taken by The Associated Press and the networks. History worked against the GOP, too. Since World War II, the party in control of the White House has lost an average 31 House seats and six Senate seats in the second midterm election of a president's tenure in office.